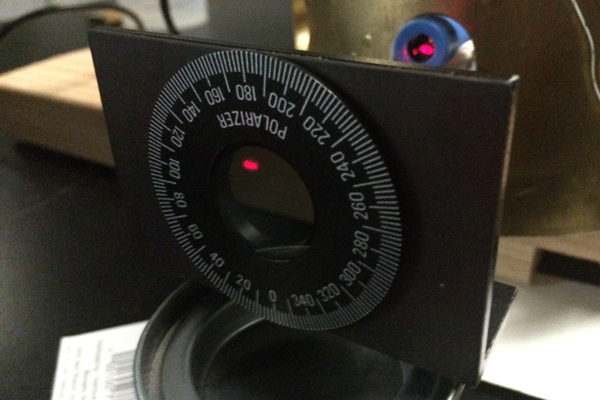 The laser is optimal for this lab in that it produces monochromatic polarized light at 650nm (red). It also produces steady illumination which is critical for the success of the lab, because we will be studying variations in the luminosity of the beam as measured by the photometer at the other end of the experiment. The solenoid is a coil of insulated wire, forcing current to wind its way round and round the loops. When current flows, a magnetic field is created. The stronger the current and the more loops there are, the stronger the field. The field will point down the tube (middle of the coil) either to the right or left, depending on the direction of the current through the wires. Because we are trying to measure only the affected angle of rotation, it does not matter which direction the current flows and hence the field points. The angle of polarization will be measurable as long as the product of the Verdet constant and the magnetic field strength is great enough. 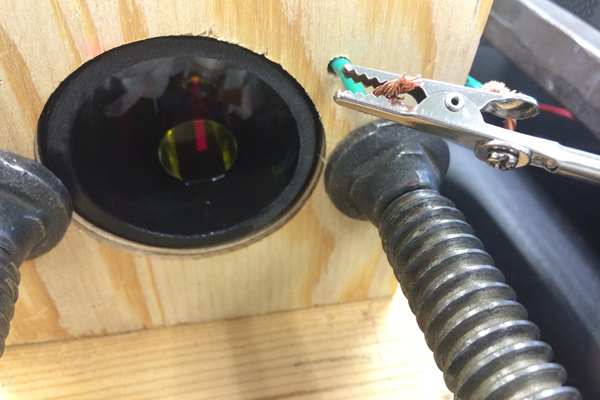 The entrance to the solenoid tube shows the cuvette resting inside the coil. It is filled with olive oil nearly to the top. The point of impact of the laser beam on the optically transparent sides of the cuvette are important to note. There should not be any smudges or foreign material that disperse the laser light. If the cuvette is handled it is important to clean the end faces with special lens cleaning paper. 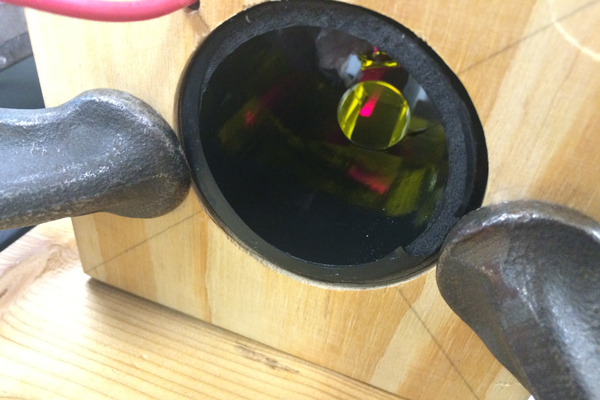 Also note that there are several reflections inside of the solenoid. Each time the beam crosses a media transition (air to glass, glass to olive oil, etc) there is a partial reflection of the beam and the transmitted illumination decreases. 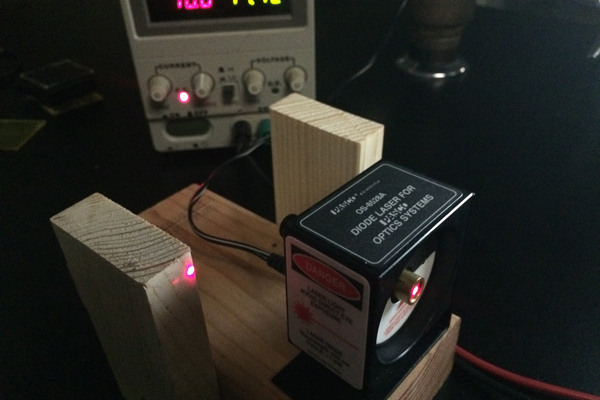 In the first picture of the equipment two partially reflected laser spots shine on the power supply for the coil and on a wooden support for the laser. 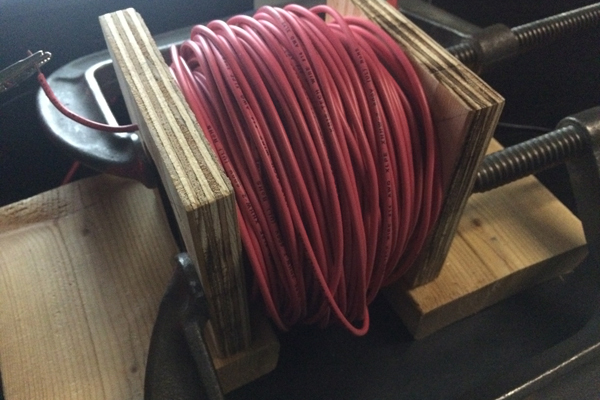 The red wire near the top left carries current through to the coil. The inside of the coil is made from common 2 in. inner diameter PVC plumbing pipe which can be found in most hardware stores. The exit green wire can be seen in this picture and connects the end of the solenoid back to the power supply. The point of exit of the laser beam can also be seen leaving the cuvette. The large screw clamps hold the wooden support braces together for the solenoid and are present only for structural support. The polarizer can be accurately set to two degree increments and is used to determine at what angle the already polarized laser beam is set. When the filter is set at an angle orthoganal to incoming light most of the light is attenuated. By rotating the filter and noting at what angle the minimum illumination occurs, one can determine the incoming angle. 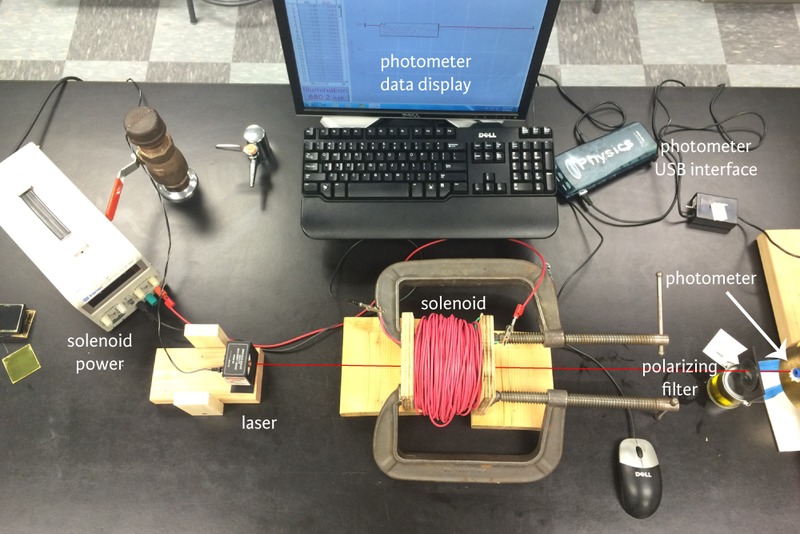 The photometer shown in the background of this picture is a solid state photo recepter. It is capable of measuring the brightness over regular intervals as narrow as 5Hz. The photometer is set to measure the luminosity at a rate of 200 times per 10 secs, or at 20Hz. This gives a sample size of n=201 and provides statistically sound data.